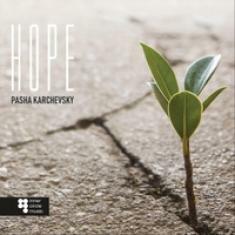 Pasha Karchevsky is a musician with a really well-rounded sense of creativity and composition. His sound is inspired by genres as diverse as Latin and contemporary jazz, bringing a broad palette of tonal flavors to the table. In particular, Karchevsky is a truly talented trumpet player. His performances are always dynamic, and he is able to voice the instrument in a particularly unique way, giving his leading tones a much broader scope than what you'd normally associate with a trumpet player. A good example is his most recent studio release, Hope. On this record, he is able to use is instrument in an expressive way, creating melodic lines that are instantly recognizable, memorable, and appealing. He has a really unique way to approach composition, and by listening to his music, you get a sense that he builds his songs around the melodic ideas that happen naturally when simply playing along. Ultimately, Karchevsky stands out for his trumpet playing skills, but also for his abilities as an arranger and visionary composer.